BIO-ORTHODOXY: Fr. Job Talats: "In Space You Can See the Grace of God"
Fr. 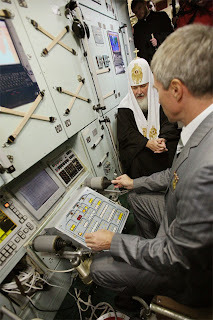 Job Talats: "In Space You Can See the Grace of God"
His Holiness Patriarch Kyrill is shown around the Yuri Gagarin Cosmonaut Training Centre and the cockpit of a spacecraft. "Space flights are in accordance with divine will, to the extent that they provide man with the opportunity to improve himself," he had stated in November. The confessor of the cosmonauts at the Yuri Gagarin Training Centre near Moscow speaks of God and of Creation with his flock, even when it is in orbit around the Earth. "Did you see God when you went up there?" This question - often sarcastically posed, sometimes with sincerity, and for others quite naggingly - is repeatedly asked of the members of space missions after their return to Earth. American astronauts had given a reply to that question - and their words were stamped in history - that... they had seen His footprints. Russian cosmonauts on the contrary would not tolerate or make any such quips on matters like these. In the atheist Soviet Union where religion was "the opium of the people", God didn't exist. Until the 1980's. Today, in Vladimir Putin's Russia, conditions are different. Russian cosmonauts admit they have their own confessor, with whom they communicate at any given moment, even when they are in space, just before embarking on their space walk. To Abbot Job Talats, these fearless cosmonauts, students of the great school that the space myth Yuri Gagarin created, are people who have their own personal fears and their own questions. They too wonder "how God created the Universe". 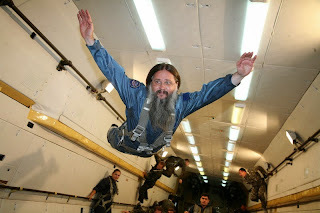 As Pastor of the Church of the Transfiguration at the Yuri Gagarin Cosmonaut Training Centre at Zvezdnogo Gorodoka (Star Town) near Moscow, he often visits the Cosmodrome of Baikonur - the Russian Cape Canaveral in neighbouring Kazakhstan - from where space missions are launched. There he spiritually prepares the cosmonauts prior to their long journey and always waits for them on their return, so that they can all offer thanks to God - as he said - together. 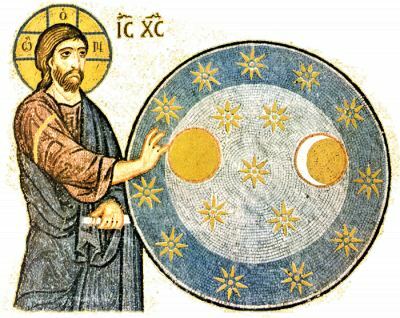 "When a man is in space, he can see the true majesty of the Universe and thus come even closer to its Creator," he stated during his communication with the newspaper "VIMA" from Baikonur, where a little earlier he had performed the Blessing of the Waters - given that the Patriarchate of Russia celebrates the Feast of the Epiphany with the old calendar. The Abbot invokes the American astronaut Frank Borman - the first man to have seen the moon at close range - who at a certain moment, after a prolonged silence inside the spaceship, uttered: "In the beginning God created the heavens and the earth. The earth was invisible and unformed..." It was the first verse of Genesis, the first Book of the Holy Bible. Many of the crew members couldn't hold back their tears at that moment... When Borman returned to Earth, someone had asked him: "Did you see God when you were up in space?" and he replied: "No, I didn't see God, but I did see the traces of His presence. ", Father Talats said. Those "traces" that Frank Borman saw at the commencement of the "Odyssey" of acquaintance with the Universe now seem to also be confessed by his Russian colleagues, the Abbot pointed out. "The cosmonauts call me before they exit the spaceship to walk in space, asking for my prayers and blessings. Yuri Lonchakov, a spaceship commander, had read the entire Bible during the entire length of his flight. During the last hours of their flight we kept in touch regularly, discussing theological matters such as how God created the world, why He created it that way, how the Saints comprehended the nature of the Universe, etc. Οleg Skripinchko, while still in orbit, rang up to congratulate us on the visit by the Patriarch Kirill to the church in the Space Centre. Moreover, Fyodor Yurchikhin of Greek descent who had recently returned from a 6-month orbit around the Earth, had with him some holy relics of Saints Theodore the Commander and Theodore the Overseer." Father Job would visit the cosmonauts with whom he had discussions and would bless every kind of technical equipment, long before a church was established inside the Space Centre. Later, "with the help of God, we acquired our own church" he said, and continued: "These last few years a whole new tradition has surfaced. All the crew members of the spacecraft visit the Holy Trinity church before launching, in order to venerate the holy relics of Saint Sergius and to participate in a brief supplication in the church of Saint Nikhon. Afterwards, I bless them with holy water and I give to each one of them a tiny, pocket-size Gospel and icons of Christ and the Theotokos, which they take with them on their flights. Four days before takeoff, I go to Baikonur to confess them and to offer them Holy Communion. We discuss spiritual matters, we read the Gospel together and we talk about various important issues. When the men return to Earth, I am there to welcome them back, with a thanksgiving supplication to God." "And of course they feel fear, just like any normal, living person in the face of a danger than can threaten his life", says Abbot Job when describing the feelings of the cosmonauts. As for what they think about, when they are outside, in the Universe? "Space is still hostile for mankind. Just imagine that in the sunlight the temperature is +180 degrees celsius, and in the dark it is -150. If a man were to suddenly find himself without a space suit, certain death would await him. Their bravery lies in the fact that they can overcome fear, by actually feeling it. The majority - with the help of God - overcome their fear and, by becoming aware of His mercy, they pray and they proceed to do what they have to do. When they are out there, they apply themselves to their work and perhaps don't think too much about whether they are afraid or not. They prepare themselves for that moment, years before. For someone to become a cosmonaut, he must prepare himself for ten years and he is therefore familiar with what awaits him. Their preparation is very good." Is that enough? "We in Russia also have a saying: 'Have your hopes in God, but do something yourself too.' When a person performs his duties correctly and with faith in God, then every difficulty - internal and external - is overcome, because only God can support, give hope, and admonish man so that he does what is right in difficult situations," Fr. Talats said. Can people be saved from their sins in space, or do they succumb to them there also? Father Job had no difficulty in answering the question. "You cannot escape from yourself. The accumulation of disadvantages and weaknesses - which leads you to the development of sins - occurs independently of where man is. The Fathers of the Church say that if we don't rid ourselves of sinfulness and passions, then we will take all of them along with us in eternal life. An envious person will remain envious in the afterlife also, but his life there will be intolerable. So, human weaknesses exist, both on Earth as well as in Space. Evil thoughts will also arise in cosmonauts just as in every person, and there will be complaints and anger, just like in every living person. They are not robots. They are intelligent, talented and multi-faceted, but also human, which is why they seek God's help." "My God, why did I return?" According to Father Job, each cosmonaut acquires (and brings with him on his return) his own experiences. "You cannot explain it. You can't explain who feels what, because people acquire many and varying experiences. One cosmonaut, Valery Oliagov, had remained in space - if I'm not mistaken - for a year and three months; in other words, he is something like a champion. During his stay in space he celebrated Pascha. He made his own Easter dessert and he chanted 'Christ is Risen', but afterwards, when he returned here, he was faced with all the everyday problems. And when he began to relive the moments and see them, he said half-seriously half-jokingly: 'My God, why did I return?'."